Motorcycle riders are required to adhere to the same road rules as other road users, so make sure that you keep up to date with the different road rules, signs and markings by reading the latest edition of The Driver's Handbook. There are some rules that are specifically for motorcycle riders which will be covered in this section. Motorcycle riders must hold a current motorcycle rider’s licence and the motorcycle must have current registration. keep both feet on the foot pegs designed for rider use. Motorcycle riders and their passengers (including sidecar passengers) in South Australia must wear either an Australian Standard (AS 1698-1988 and AS/NZS 1698:2006) or European (ECE 22.05) standard motor bike helmet. The helmet must be properly fitted and securely fastened and must be marked with an official standards mark certifying compliance with the relevant standard. motorcycles. Motorcycle riders can legally travel in any part of the lane. 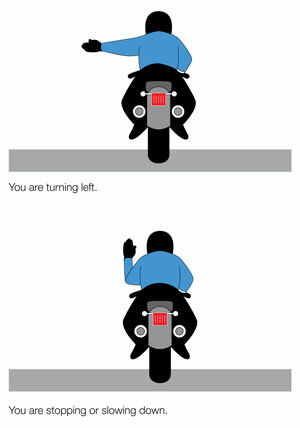 Motorcycle riders can use hand signals for stopping, slowing or turning. Hand signals can improve rider safety when bright light conditions make it difficult for the motorcycle’s brake and indicator lights to be seen. To signal for stopping or slowing, extend either arm horizontally and bent at a right angle with a flat palm. To signal for turning, extend a straight arm with flat palm pointing in the direction of the turn. be eight years of age or older. not interfere with the rider’s control of the motorcycle or distract the rider. The motorcycle rider must not ride with more than one passenger (excluding sidecar passengers) on the motorcycle. 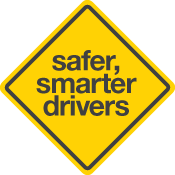 Learner riders can only carry a pillion passenger who is acting as a Qualified Supervising Driver who has held a current unrestricted Class R licence for the preceding 2 years. The motorcycle rider must not ride with more passengers than the sidecar is designed and approved to carry. Children under eight are allowed to travel in a sidecar. Motorcycles are not designed to carry large loads. Consult your motorcycle manual to find out the total weight your vehicle is designed to carry, including rider and pillion. Low – Ideally with the use of panniers or on the seat. If a load is too high it may unbalance your motorcycle. Avoid carrying heavy or unwieldy loads on your back. Forward – Place your load above or in front of the rear axle as anything behind the rear axle can potentially have a serious effect on motorcycle handling. Balanced – Fill panniers evenly or strap heavier loads onto the seat. Secure – Pack the load as above or strap it carefully to the motorcycle. A loose load or strap could catch in the rear wheel or chain and cause a crash. Extreme care should be taken when using straps equipped with hooks as they are a major cause of eye loss. The width of your loaded motorcycle must not exceed one metre maximum. Nothing in the load should project out from the motorcycle in a way that is likely to injure pedestrians, or to obstruct or damage another vehicle (or anything else, including the road surface). When a motorcycle is being towed by another vehicle using a towline (chain, rope, fabric, strap or wire), the distance between the two vehicles must not exceed 2.5 metres. When the towline is longer than 2 metres, you must attach a white or brightly coloured flag, piece of cloth or other similar material to the line as a warning.